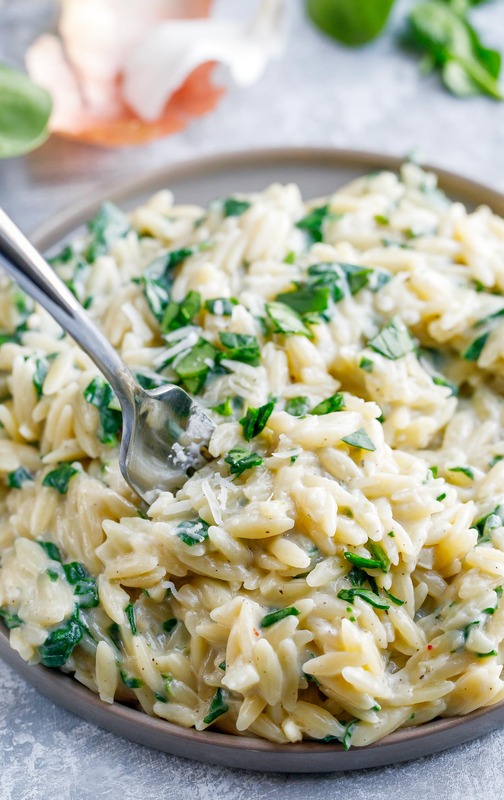 Creamy Garlic Parmesan Orzo is a perfect side dish for dinner tonight! This tasty twist on mac and cheese will have you going back for seconds! I’m going to attempt to keep things short and sweet today because I have a huge stack of books next to my bed that are calling my name. They’re also TRIPPING me every time I get out of bed. Jerks. My book obsession is getting a bit out of hand as my TBR list increases almost daily. Right now I’m about halfway through What Alice Forgot and don’t want to put it down! I may start carving out designated binge-reading nights so I can catch up. Sleep? What’s that? I don’t need no stinkin’ sleep! Lies! I need all the sleep! And of course some cheesy pasta to dream about! This totally luscious one-pot garlic parmesan orzo pasta makes an all-star side dish. You may even want to go ahead and make it a main course! I’m thinking a big piping hot bowl of cheesy, garlicky orzo with a side of roasted broccoli or asparagus… maybe even a little side salad action to pack in extra veg… YES PLEASE! This jazzed up cheesy pasta is ready to rock your plate. Print out the recipe card below and meet me in the kitchen! Creamy Garlic Parmesan Orzo is a perfect side dish for dinner tonight! This grown up twist on mac and cheese will have you going back for seconds. Melt butter in a large pan (grab one that's deep enough for your orzo + sauce) over medium-high heat and sauté your shallot and garlic until tender, adding the garlic towards the end to prevent burning. If extra butter is needed, feel free to add as desired. Add your milk, broth, salt, pepper, and garlic powder. Stir with a whisk to deglaze the pan. With your burner set to medium (I had mine set to 6) add the orzo and stir. Set timer for 10 minutes. Once the orzo starts to really boil and bubble, reduce heat to low (2 worked great on my stove) and continue to simmer, stirring occasionally. Once the pasta is al-dente or your ideal softness, remove from heat. Sauce will be thin and thicken as it cools. Add your parmesan cheese and chopped spinach and fold into the orzo. Season to taste as desired, garnish with any additional cheese your heart desires and dig in while it's hot! * No shallot? No problem! Finely minced white or yellow onion will totally work here. 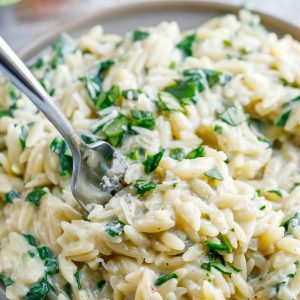 If you get a chance to try this tasty garlic parmesan orzo recipe, let me know! You can leave me a comment here (LOVE checking those daily!) or tag @PEASandCRAYONS on Instagram so I can happy dance over your creations. I can’t wait to see what you whip up! Cheesy Garlic Parmesan Spinach Spaghetti Squash <– READER FAVORITE! This was DELICIOUS! I’m a vegetarian, so I followed the recipe. But for my husband, I marinaded chicken breast in garlic and herb marinade the night before, baked it and he cut it up and mixed it in the pasta. Thank you for sharing! Delicious side dish made for a neighborhood party. Used green onions and doubled recipe. Took a while longer to cook, but I’ll be making this again! 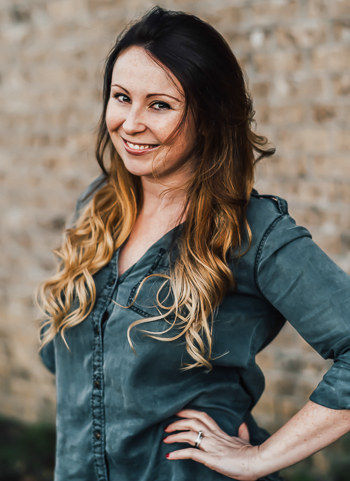 Thank you Melissa – I’m so stoked it’s making repeat status! Woot! This is OUTRAGEOUS! My family loved this & it’s so simple! This was amazing! I used half milk half heavy cream. Yay!! So glad you enjoyed it Tamiya! This recipe is one that gets categorized as a ‘family favorite’! Made it for the firs time and we all LOVED it! I had some mushrooms that were lonely in the fridge, so I threw them in too! Turned out fantastic! Day = Made!!! Thanks Ramona! I have no orzo in my pantry. Do you think a small pasta like ditalini might make an okay substitute? Ooh and you could also just make the pasta in a separate pot-o-water, strain, and add then it to the dish. This way it would 100% work since the longer cook time wouldn’t be a factor here! Hope this helps! Girl, you’re speaking my language with that orzo! There’s never enough garlic in the world for me! 🙂 YUM! YES! Come over for dinner and we can garlic it up!